In other words, “whoever owns the soil, it is theirs all the way up to Heaven and down to Hell”. Instead, DCLG are proposing that underground access rights be granted to companies extracting petroleum or geothermal energy in land at least 300 metres below the surface – regardless of the feelings of the landowner. The result could be landowners set against fracking, being forced to resign to it happening under their very noses. “Given that a large area of underground land may be accessed in shale or geothermal operations, companies may need to negotiate access rights with hundreds or possibly even thousands of land owners whose land is above that area” the consultation said. Naturally, this process would be extensive and costly for the energy companies, delaying the resource extraction process and potentially jeopardising it entirely in areas. 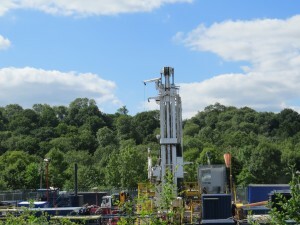 The consultation proposes instead that a “public notification system” be introduced, under which shale gas firms would outline matters such as the “relevant area of underground land, coupled with details on the payment that will be made in return for the access”. It’s not all doom and gloom for affected landowners though, the same consultation states clearly that the government believes people living above underground drilling should receive compensation from the operator in return for the right of access. It says that the government supports a voluntary offer for a payment system put forward by the shale and geothermal industries – a system which would involve a £20,000 one-off payment for “each unique lateral (horizontal) well that extends by more than 200 metres laterally”. The government’s preference is for this payment to be made to a relevant community body and not split between individual landowners, however, so landowners might not actually see a penny of their compensation after all. “The change in law would remove one of the main obstacles to investor confidence. At present the only way operators can use underground land for fracking is to obtain the consent of all land owners above, or apply to court for the grant of compulsory rights under the protracted Mines (Working Facilities and Support) Act 1966 procedure. With the recent ECO consultation results showing just how much notice the Government takes of stakeholder’s views on its policies, this document – Consultation on Underground Drilling Access – seems almost inevitably to be riding a tidal wave of opposition all the way into law.